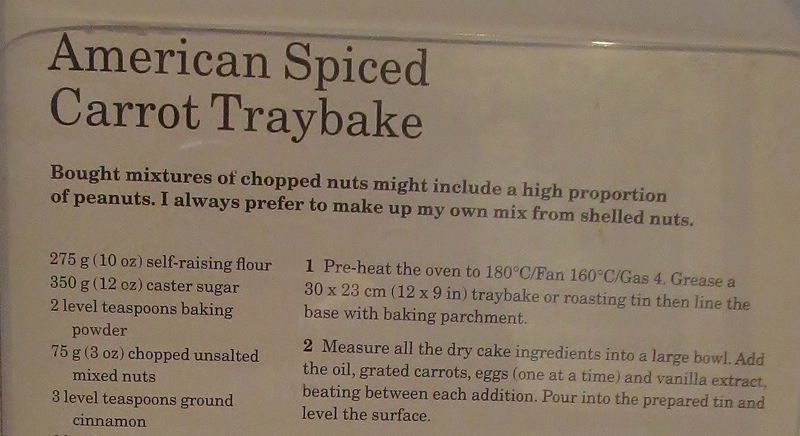 ‘s Baking Bible and found this delightful sounding recipe for American Spiced Carrot Traybake. Mary asks you to weigh out all the dry ingredients first which I did and then add each of the wet ingredients one at a time and mix well in between. I used my trusty food processor for this and it did a great job. The hairy hoolies were most attentive while I was grating the carrots as carrots are one of their most favourite treats – and yes, they got the end bits that i didn’t grate ! I mixed the wet ingredients one at a time and then poured the mix into a tray bake tin ( Lakeland- my favourite shop- don’t think I have mentioned that before?!) I then popped this in the oven and left it to bake for an hour. When the pinger went I got the traybake out and it smelled lovely. I left it to cool for a short while then transferred it to a cooling rack. 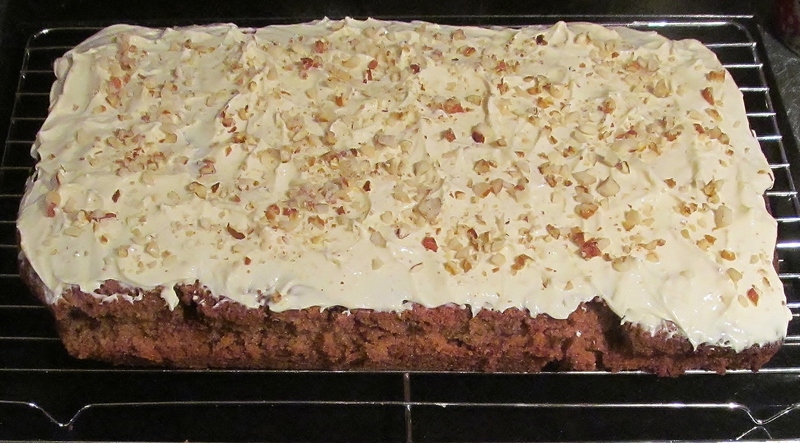 The topping was soft cheese, honey and lemon juice with chopped nuts on the top. I must admit that carrot cake is one of my favourite cakes and Mary’s twist on americanising this is lovely. It will be all hands to deck next week as I have big plans to cook all my christmas cakes and put up the decorations so it will be very festive in our house next week! This entry was posted in Kim's cake challenge and tagged american spiced carrot traybake, Baking Bible, Christmas, Cook, Great British Bake-Off, Kim, Kim's american spiced carrot tray bake, Kim's Cake Challenge, kims cake challenge, lakeland, Mary Berry, Mary Berry's American Spiced Carrot traybake, Mary Berry's Baking Bible, traybake, traybake tin by kimsideas. Bookmark the permalink. Even better than last week. Carrot cake my favourite and beautifully moist. More please better than most coffee houses! !